Though a powerful entity in his own right, Robomo, the mystic diety and eternal guardian of Modojo, isn't the only iconic mascot who wields the knowledge of the ancients alongside a penchant for heavy metal. Despite not being literally composed of metal like the aforementioned legend, Iron Maiden mascot Eddie lives and breathes metal all the same, and now his dominion over the mobile gaming world is expanding. Eddie is soon to be featured in a new Halloween-themed crossover with the iconic Angry Birds franchise in the new Angry Birds Evolution Tribute to Iron Maiden mashup event, and if one thing can be said for certain, it's that Eddie will be one of the most formidable combatants yet. Like the other birds featured in Angry Birds Evolution, Eddie will have four evolved forms of his own, each of which being based on a particular Iron Maiden album. Though we don't know which album will represent Eddie's ultimate form, we do know that each version of the character will be based on the three classic Iron Maiden albums Killers, Powerslave, and Somewhere in Time, with a fourth version for Book of Souls, the band's latest and sixteenth album overall. And all of this is on top of the general Iron Maiden-inspired overhaul that the game will receive as part of the special event. 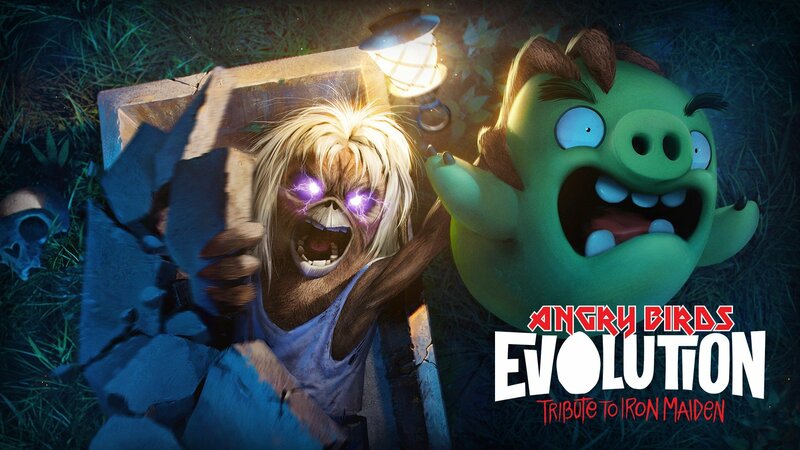 As a bonus to fans who know just when to Up The Irons, Angry Birds Evolution players who manage to recruit Eddie will be able to keep him as a character forevermore. Just be sure to grab him up quick, as the Angry Birds Evolution Tribute to Iron Maiden mashup event isn't going to last long: players will be able to scoop up Eddie when the event goes live on October 18th, and will continue to do so until the event ends on the night of October 31. If you're keen on picking up some great mobile games on the cheap, we recommend picking up some of the fantastic freebie titles we've featured on our list of the Best Free To Play Games.